While the Magnificat text has enthralled me for some time, I gained new appreciation for this ancient canticle last year upon learning my wife was pregnant with our firstborn child. Shortly afterwards, I was asked to write a piece for the City Choir, and the Magnificat text immediately came to mind. News of my wife's pregnancy conjured strong feelings of joy, apprehension, serenity, and worry, all in turn. This response reminded me of the Doctrine of the Affections, a Baroque theory of musical aesthetics in which musical gestures move the bodily humors, prompting various physical and emotional responses. Thus, I decided to look to Baroque music, which I hold dearly to my heart, for inspiration. My setting divides the text into five sections, with each of the first four exploring a different Baroque form, as well as one of the Four Temperaments central to the Doctrine of the Affections. I composed my Magnificat in honor of The City Choir of Washington and Robert Shafer on his 50th anniversary of conducting in the District of Columbia. The work is dedicated to my wife Santana, and our daughter Magdalena, both of whom cause my spirit to rejoice in God my savior. In writing this setting of the Magnificat (and its corresponding Nunc Dimittis), I have attempted to create something that would work within the constraints common to a large segment of parish churches in the English-speaking world. Its forces are not only small, but also modular: the work may be sung by treble, adult male, or mixed voices. Its music seeks to form a connection with various older styles, such as Gregorian chant (heard in its modal harmonies and psalmtone-inspired incipit) and the classical sonata form. Like its corresponding Magnificat, this setting of the ancient Song of Simeon was written with practicality in mind. The organ takes its cantus firmus from the hymn Mit Fried und Freud ich fahr dahin. This melody is commonly known as the Lutheran Nunc Dimittis, and has inspired numerous composers, including Bach, Buxtehude and Brahms. The Risen Christ is my own arrangement of Walter Greatorex's resolute tune WOODLANDS, given new life by Nigel Weaver's splendid text. A Pentecost anthem for intimate forces. Swee Hong Lim's tuneful melody WAIRUA TAPU marries perfectly with Shirley Erena Murray's evocative text in the hymn As the Wind Song. My arrangement seeks to preserve the simplicity, accessibility, and melody-driven textures of the source material as found in the Glory to God: the Presbyterian Hymnal. The addition of a flute and wind chime work in tandem with a newly-written piano part to paint the various images presented by Murray's pictorial text. In 1616, a city official in the German town of Jena commissioned 16 composers (including Schütz, Schein, and Prätorius) to set Psalm 116 to music. Four centuries later, in celebration of their 30th season, the Hamburg vocal ensemble vOkabile asked eight composers for their own take on this ancient text. Der Tod seiner Heiligen sets verses 15 and 16 of the psalm, along with portions of the Great Litany of the Saints, blending Renaissance counterpoint with aleatoric chanting and a modernist take on sacred cantillation. 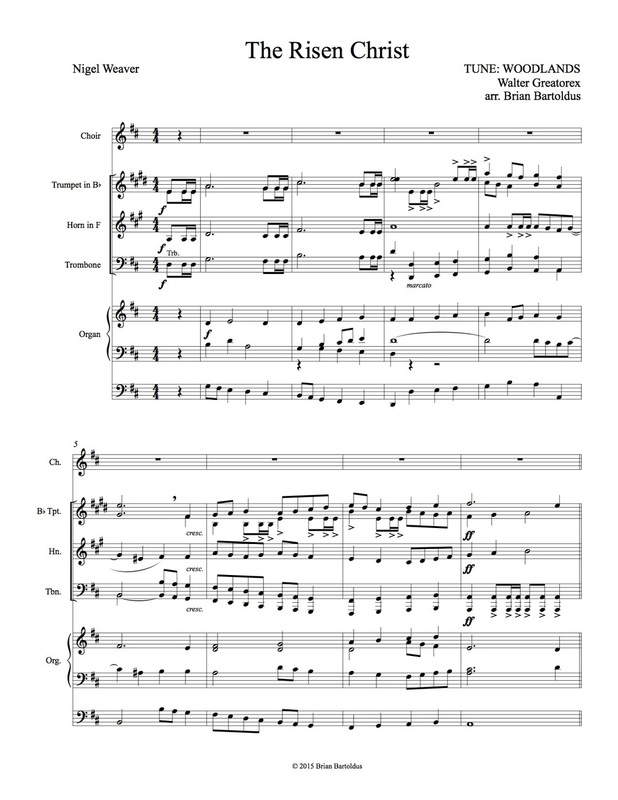 Scores of all of the above works are available through the composer.